Sol. A debit cards a safe, convenient, risk-free alternative to cash and has no credit risks attached. Sol. Definition of traditional economy: A type of economy that still uses various means of social support. Some feel that this may be out of date and thus refer to it as a traditional economy. Sol. The Automated Data Flow (ADF) is a unique initiation by RBI aimed at the purpose of meeting the needs for accurate and consistent flow of data. Automated Data Flow ensures that the data submitted from the banks to Reserve Bank of India is correct and consistent without any kind of manual intervention. Sol. KYC guidelines/instructions are issued under under Prevention of Money laundering Act PMLA, 2002. Q6. Which of the following is a receipt, declaring ownership of shares of a foreign company and it can be listed in India and traded in rupees? Sol. An IDR (Indian Depository Receipts)is a receipt, declaring ownership of shares of a foreign company. These receipts can be listed in India and traded in rupees. Q7. What is the term for a bank without any branch network that offers its services remotely? Sol. A direct bank is a bank without any branch network that offers its services remotely via online banking and telephone banking and may also provide access via ATMs (often through interbank network alliances), mail and mobile. By eliminating the costs associated with bank branches, direct banks can make significant savings which they may pass on to clients via higher interest rates or lower service charges. Q8. The opening of branches by banks is governed by the provisions of Section _______ of the Banking Regulation Act, 1949. Sol. The opening of branches by banks is governed by the provisions of Section 23 of the Banking Regulation Act, 1949. 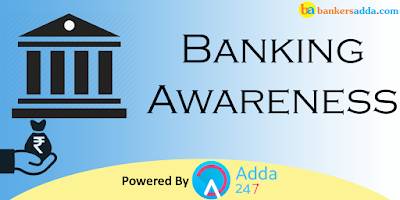 In terms of these provisions, banks cannot open a new place of business in India or abroad or change otherwise than within the same city, town or village, the location of the existing place of business without the prior approval of the Reserve Bank of India (RBI). Thus, it is mandatory for RRBs to seek prior approval/licence from Rural Planning and Credit Department (RPCD) of RBI before opening of new branches/offices. Sol. Ultra Small Branches may be set up between the base branch and BC locations so as to provide support to about 8-10 BC Units at a reasonable distance of 3-4 kilometres. These could be either newly set up or by conversion of the BC outlets. Such Ultra Small Branches should have minimum infrastructure such as a Core Banking Solution (CBS) terminal linked to a pass book printer and a safe for cash retention for operating large customer transaction and would have to be managed full time by bank officers/employees. Q10. Which among the following conditions, Regional Rural Banks (RRBs) should fulfil to become eligible to open new branch/es? iv. Net NPA ratio does not exceed 8 per cent. Q15. Sukanya Samriddhi Account can be opened up to the age of ________ years only from the date of birth.